Welcome to Your Next Stamp October Release Preview Day! I have a fun project for you today. 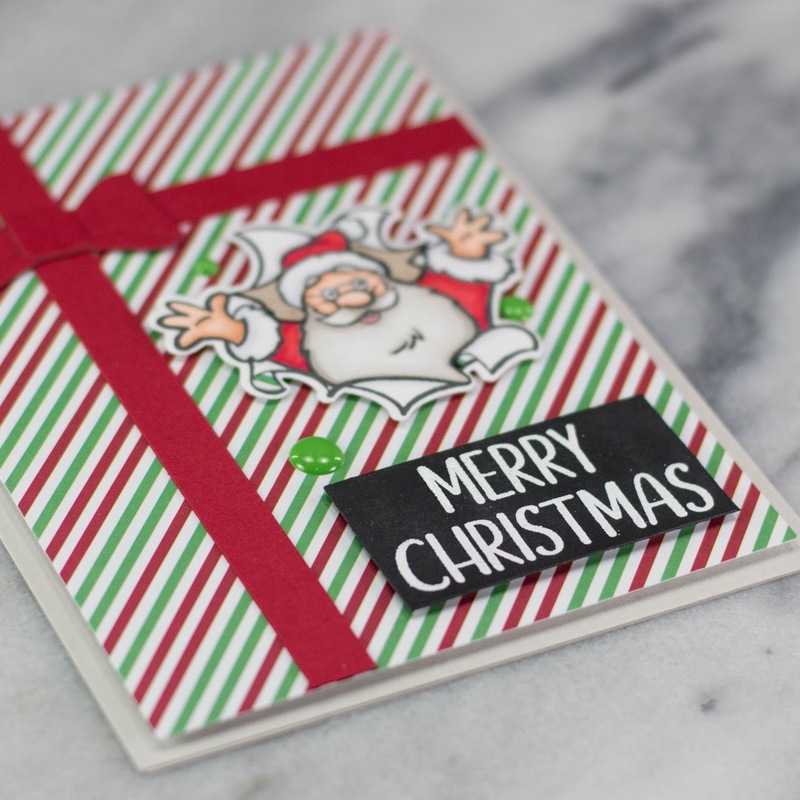 I am using the brand new Be Jolly stamp set and coordinating dies for my project. 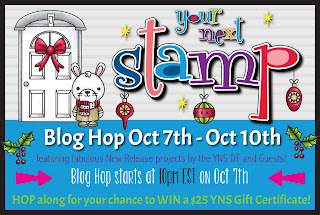 To see what the other Design Team members and guest designers have made, visit the Your Next Stamp Blog or (CLICK HERE!). To see all the new release products once they go live on Oct. 7th, (CLICK HERE!) to go to the new products page in the Your Next Stamp online store. We will be having our new release blog hop tonight at 10 PM EST. 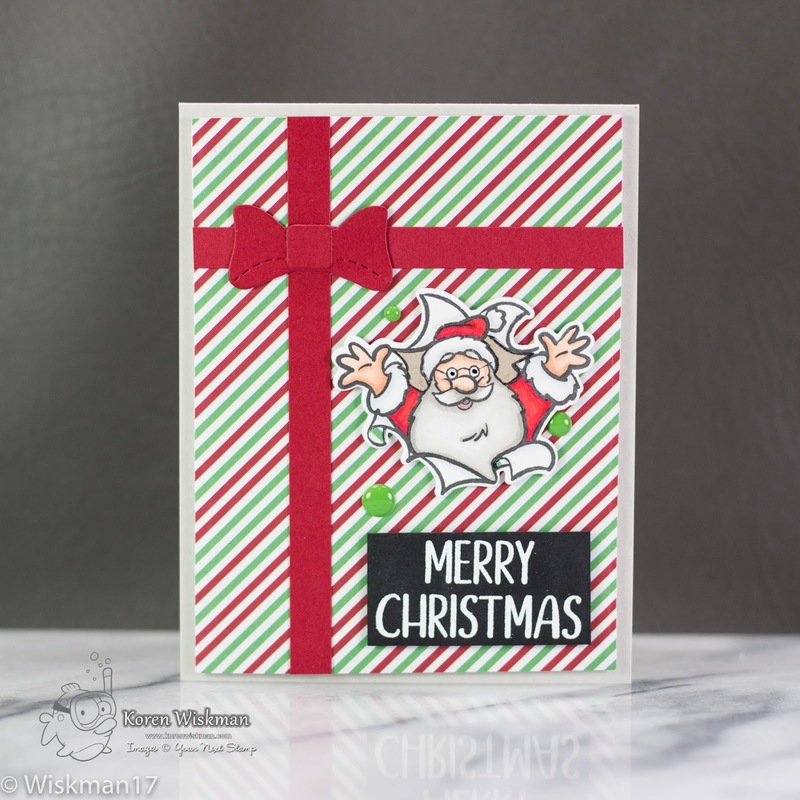 I started out wanting to use the Santa image that looks like he is popping out of a present. So, I stamped him with Your Next Stamp black olive ink and colored him with Copic Markers. I also stamped him on some patterned paper and some Neenah Desert Storm cardstock. I needed to paper piece some of the elements of the image. The under pieces of the paper and the area behind Santa. I was hoping to make it more realistic that way. For more details, click on the link below, that will take you to the YouTube video I made making this card. I then used the Party Dress die set bow, the largest bow, to create a gift out of my card front. I cut strips of paper to act as ribbon. I popped up my image and sentiment with 3M foam tape and called it a day. Photos of my project, a link to my YouTube video, and links to supplies used are listed below. Thank you for visiting my blog today. 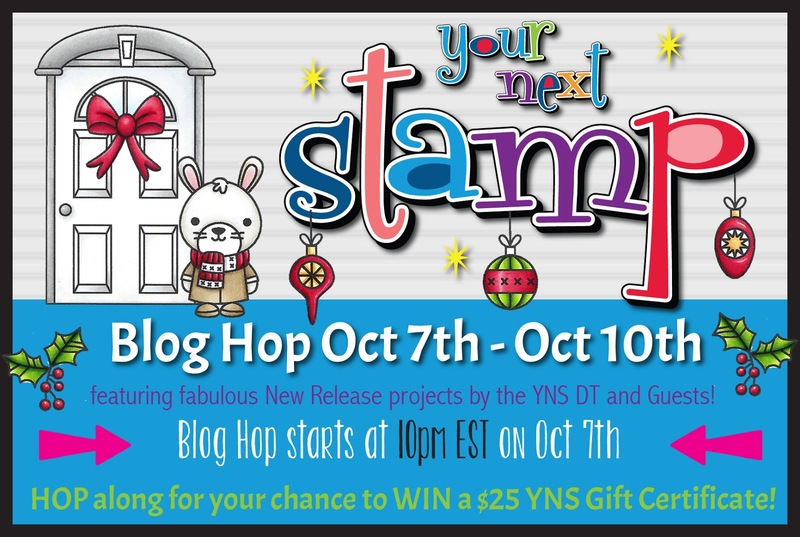 Don't forget about the Blog hop tonight at 10pm EST. This is a great card and the paper ribbon/bow looks awesome. Hahaha! I love it! What a fun card! I'm going to love this stamp set! That's such a fun Santa card !! Very festive ! Oh my heavens I am in LOVE with this fun card! Great job! Wow! Such a gorgeous card.... simple, but.... many steps. Everything goes perfect with one another. Your card is so festive and fun!!! love the big ribbon around the santa card!! !great release!! !